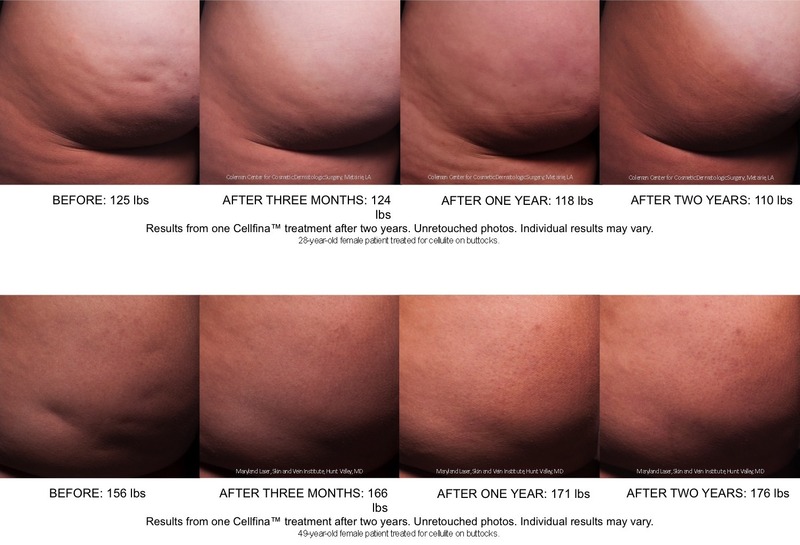 Dr Kathleen Gilmore in Ann Arbor Michigan to offer Cellfina – a breakthrough cellulite treatment that gets remarkable, lasting results. Many temporary options of varying effectiveness have been available for cellulite, and now the much sought after real effective minimally invasive solution for bothersome dimples on the buttocks and thighs of women has arrived in the Cellfina treatment. 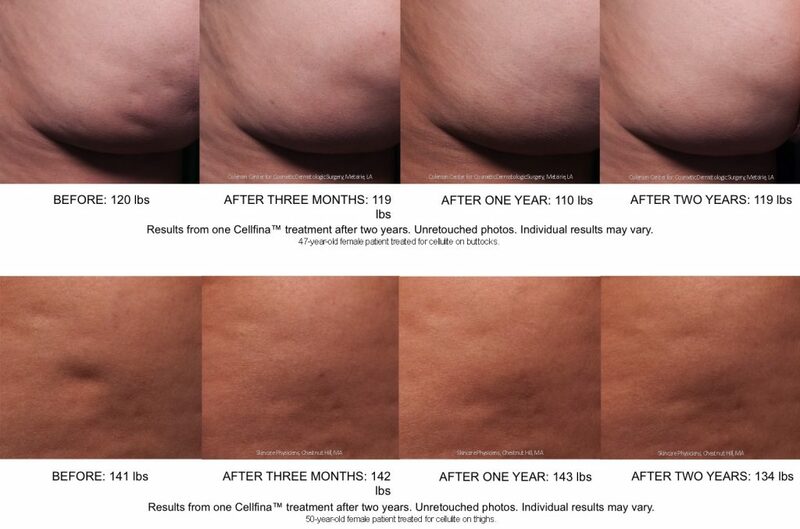 The only device cleared by the FDA to reduce the appearance of cellulite for at least 2 years. Cellulite effects up to 90% of women. It is most commonly present on the thighs and buttocks. Weight loss does not typically resolve cellulite because the soft tissue bands are still present. Cellfina is not a correction for loose or sagging skin which would need to be distinguished from cellulite. This can be assessed during your consultation. Additionally if you have other concerns in the area, such as saddlebags, these can be addressed with UltraShape, and sagging or lax tissue can be addressed with Ulthera in some instances. Cellfina aims straight at the problem. Other treatments only work to temporarily smooth the appearance of the skin overlying the problem of the dimpling, never addressing the dimpling itself. Under the skin, we have fat cells that can expand as we gain weight, and contract or get smaller as we lose weight. Where we see the dimples, are tethered bands strands of tissue that are randomly attached indenting the skin. Think of a mattress. The Cellfina procedure uses a microblade to release these bands freeing up the indented points on the skin. 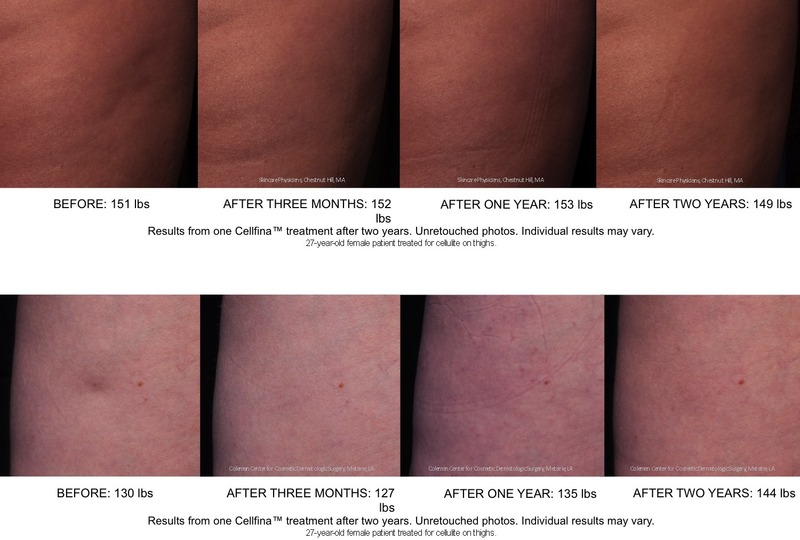 Cellfina requires just one treatment session, which lasts approximately one hour. We first mark the areas to be treated. The areas are thoroughly cleansed and then local anesthetic(numbing medication) is given to the marked areas adding to your comfort during the procedure. The Cellfina device applies suction (or vacuum) over the marked dimple positioning the band so that the microblade can release it. This process is repeated until all the marked dimples have been released. Bruising is expected, but other than bruising you are up and back to regular activities. You are asked to restrain from strenuous activity for 3 weeks, but the majority of people go back to work the same day of treatment. You can expect to see results as early as 2 weeks, and they improve from there. 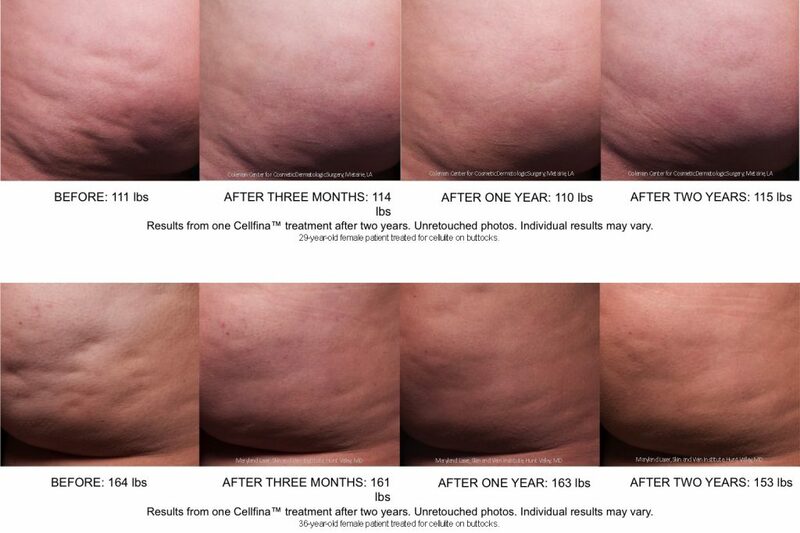 Cellfina now has shown in studies a satisfaction rate of 93% at 3 years.